PMI is the world’s most successful cigarette company, with the world’s most popular and iconic brands. But the company has made a dramatic decision: to build a future on smoke-free products, with a vision to replace cigarettes with less harmful alternatives as soon as possible. 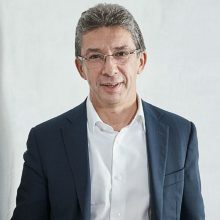 This transformation is led by André Calantzopoulos, who was named Chief Executive Officer and was elected to the Board of Directors on May 8, 2013. He served as Chief Operating Officer from our spin-off on March 28, 2008 to May 8, 2013. André was PMI’s President and Chief Executive Officer between 2002 and the date of the spin-off. After joining the company in 1985, he worked extensively across Central Europe, including as Managing Director of PM Poland and President of the Eastern European Region. André holds a degree in electrical engineering from Swiss Federal Institute of Technology in Lausanne and an MBA from INSEAD in France.